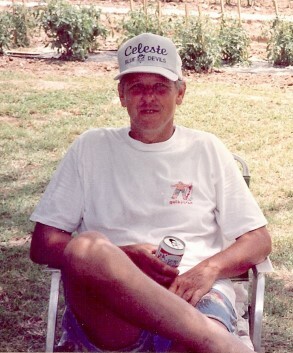 As long as I can remember, when Mike Lewis worked at Alcatel/Rockwell, he always had a summer picnic up at his place in the country near Celeste, and invited everyone from work to attend. We had some good times there over the years. 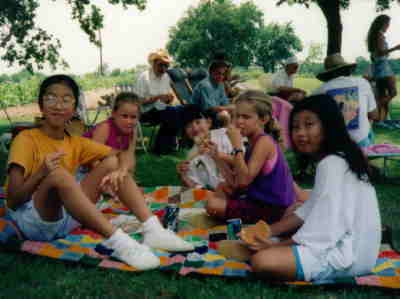 These pictures span several years of picnics. We miss you and the picnics Mike! Must have been a year or so back. I had a little more hair, and it was darker too! Looks like we were enjoying ourselves. 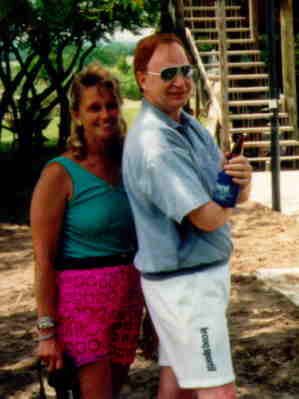 That Tee shirt caption says "I was going to take up jogging, but it kept making my beer foam up." 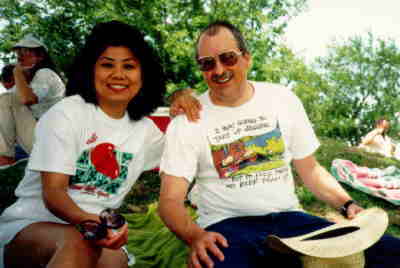 Jim and Connie Wallner were always at the picnics. 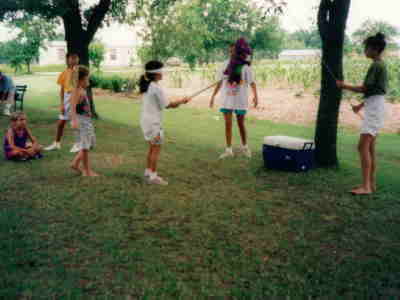 Connie was filling up water balloons for one of the games when the kids ganged up on her. 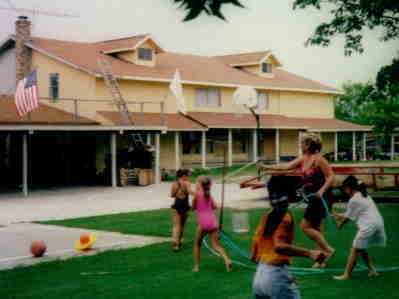 What they neglected to notice though, was that she still had the hose. We're known to take a bunch of kids with us on outings from time to time. This batch fancied themselves fisherwomen, so I had to stop and buy them bait on the way up. So far as I know the count of fish in Mike's tank stayed the same because we didn't take any home! 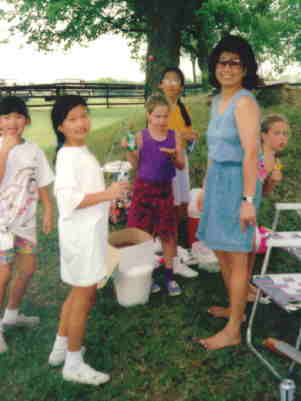 That's Millie Lee, Melanie May, Stephanie Ng, Monica May, and Sherene Ng. I'm in the cowboy hat behind them, and that's Jim Wallner sitting next to me. Oops! Mike's cat had a litter of kittens. 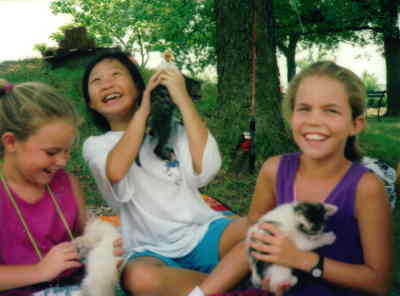 What is it about girls and kittens? Here's Angie doing her imitation of a barefoot country girl. 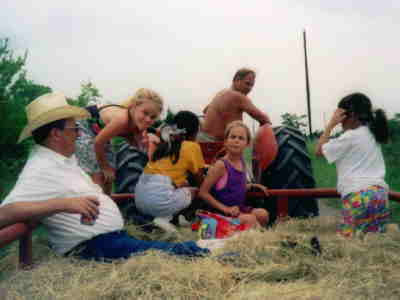 Mike took all the kids including me on a Hayride. He even let them drive the tractor. He really made a lasting impression on a bunch of little girls I think. The finish of a great day was usually marked with a Piñata. I think the parents must have gotten a real pleasure out of seeing a bunch of kids whipping up on a certain purple dinosaur! Mike had a fine crop of roastin' ears growing over there in the garden. Picked a peck or so and threw them in the BBQ. Taught the girls to pull the shuck back to eat it. Those kids are still talking about how good the corn was. Before this those girls didn't know that corn came with leaves!